The Business and Practice of Coaching - Description | W. W. Norton & Company Ltd.
An estimated 30,000 coaches have entered the coaching profession during the past five years. Unfortunately, the majority report they are unable to earn a living wage from their coaching services. Competition is high, and the knowledge of how to succeed in the business is often lacking. To survive today, coaches must match their enthusiasm with strong business and marketing expertise. Lynn Grodzki and Wendy Allen are veteran business coaches who understand how to strategically approach the business and the practice of coaching as well as how to mentor new coaches entering the profession. 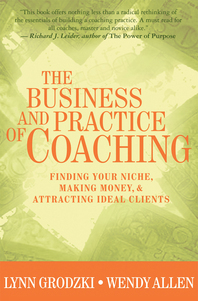 The Business and Practice of Coaching is the first text to combine a coaching approach (step-by-step exercises, direct suggestions, insider's tips, and motivational plans) with solid business information and ideas in order to give new and experienced coaches exactly what they need to prosper in the competitive business of coaching. Grodzki and Allen help coaches succeed by giving them the right information, showing them how to develop an entrepreneurial mind-set, and demonstrating how to customize a business plan that can spell the difference between accomplishment and collapse. Grodzki and Allen gives each reader the ability to: * Build a coaching business that has relevance to the larger community around it and be aligned with the new realities of the coaching profession. * Refine your coaching skill set to incorporate the five coaching competencies that signal to the public that you are a masterful coach. * Define your innate coaching specialty and target a profitable niche market so you can make a bigger impact as a coach. * Implement the eight best marketing strategies to attract coaching clients (and know the marketing ideas that coaches do best to avoid). * Set and raise your fees the right way, develop multiple streams of coaching income, and build a six-figure business that you can own and sell. * Institute risk management policies that ensure your practice is legally safe, ethically sound, and trouble free. Covering all of the territory from positioning your coaching business, differentiating it from the competition, acquiring basic entrepreneurial skills, and learning from profiles of master coaches The Business and Practice of Coaching offers a wealth of information and accessible, yet expert guidance. Readers will discover how to take advantage of current trends and avoid distracting hype within the quickly changing coaching profession so that the coaching business they build today will be viable tomorrow.